In Thailand, Surat Thani oyster is known as the best oyster in the country, but for the Thais, you have also to enjoy the fresh oysters the Surat Thani way. According to the Hotel Novotel Platinum marketing manager Ms. Sharon Kaserer, the Surat Thani oyster has to be eaten with Krathin, lime, fried shallots and Thai Chili sauce. Gibson tried it and loved it. 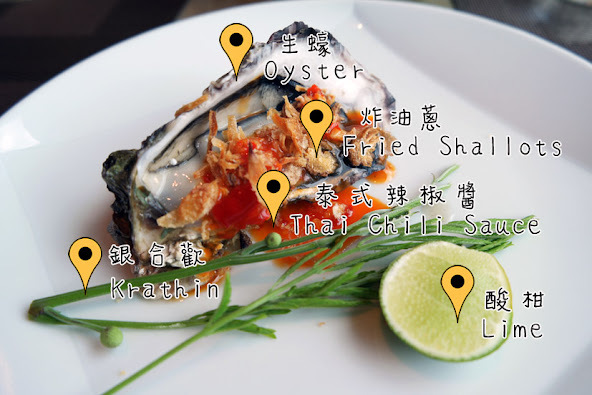 It really brings out the best in the oyster in an interesting way that enhances the richness of its flavor and texture. Something you would not get out of eating it in the usual way with lemon. Gibson was too excited about the oyster that he forgot to mention about the best place to look for oyster and others seafood. Every weekend with only 1000 Baht net you can enjoy a huge spread of seafood dishes for the seafood brunch at Hotel Novotel Platinum. With an addition of 500 Baht, you have the privilege of having a free flow of alcohol and happily get drunk. The Seafood Buffet Brunch at The Square Restaurant of the hotel is well known for its Alaskan king crab, that’s why they freeze one and showcase at the entrance. However, Alaskan king crab is limited to ONE plate of crab per table. Besides Alaskan king crab, you can enjoy many others like oysters, mussels, Rock Lobster, and Salmon etc. This is where you can pick and choose from a variety of fresh seafood as you fancy them. The seafood buffet here is really like a seafood fest, and the whole kitchen labored to ensure every dish fits perfectly into the seafood theme, whereby besides dessert, fruit and drinks, most are seafood. Gibson really enjoyed the seafood platter and canapé that is full of imagination. He has to compliment the chefs in being able to present authentic Thai cuisine yet some are very fusion with the touch of Thai spices. There is too many to feature here, so Gibson had taken the liberty of presenting only these samples for your eyes only. Behold the platter, finger food or canapé. If you are a big Fan of salmon, you have walked right into salmon haven. Whatever way you can think of in preparing the salmon, from the Sashimi, grilled, roasted, smoked to pie, you name it and they have it. They do serve some other Sashimi too. Here are all the Sushi. Hotel Novotel Platinum has a very good reputation for their roasted stuffs, especially the roasted pork that is crispy and full of flavor. Now let see the choices of the main course, and of course with seafood. A good buffet is never without a good fruit decoration. Don’t you agree? As Gibson mentioned in the previous post about the Breakfast in this hotel, their bakeries and pastries are not to be missed, because they freshly bake every day. You can refer back to the Breakfast post to find out more. However, the desserts are on a rotation basis, if you happen to see something with green tea, please take a bite, you will love it. Address: 220, Petchaburi Road, Ratchatevee, 10400, Bangkok, Thailand. The price list presented here is as on 5rd September, the day when I visited the restaurant; the price inclusive of 10% service charge and 7% VAT.